Apple Pay has the largest percentage of supporting US merchants with 36% accepting the mobile payment service today, up from 16% last year, research released by Boston Retail Partners (BRP) reveals. 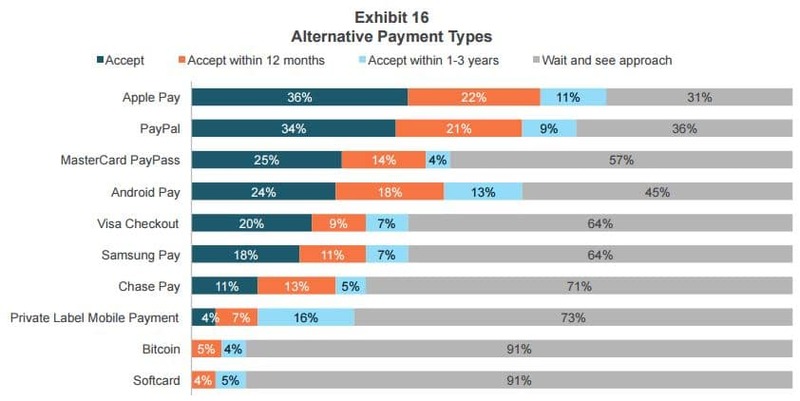 Some 22% of retailers are planning to accept Apple Pay in the next 12 months and 11% plan to do so within the next one to three years, while 31% are adopting a “wait and see” approach. PayPal falls in second place with a 34% acceptance rate, followed by Mastercard PayPass (25%), Android Pay (24%), Visa Checkout (20%), Samsung Pay (18%), Chase Pay (11%) and private label mobile wallets with 4%, the 18th annual edition of the POS/Customer Engagement Survey shows. 18% of more than 500 top North American retailers surveyed are planning to accept Android Pay within the next 12 months, with 13% planning to accept it within the next one to three years, while 11% are planning to accept Samsung Pay in the next 12 months, with 7% planning to accept it within the next one to three years. 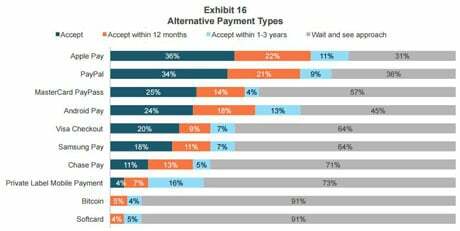 Only 11% of the retailers have “no plans to implement” mobile payment acceptance within the store environment, while 24% of overall respondents have already done so and say the system is “working well.” 9% are offering mobile coupons, specials and promotions, while 7% are offering mobile loyalty programs. “There are a multitude of mobile wallets and payment apps on the market today, and the arena keeps changing,” says BRP. “In the past year, we have seen the demise of the merchant-backed CurrentC and rise of Walmart Pay. “One of the critical factors for any mobile payment success going forward is education. We have found repeatedly that not only are consumers unsure of how and when mobile payments can be used but, even more telling, associates are unsure,” BRP adds. I’m having a MAJOR problem with this article. First off, SamsungPay supports ‘magstripe emulation’ mode which doesn’t require permissions from the bank and works with any magstripe terminal which is.. all of them. So it has a 100% share of terminals. Also, since Android Pay uses the same protocols as Apple (what – you thought Apple invented a protocol and the entire banking industry just jumped on the bandwagon?) any terminal that can take Apple Pay should be able to take Android Pay as well. The actual difference isn’t the terminals, it’s the number of banks supporting it, and the availability of NFC to make it work. A LOT of Android phones don’t include NFC. Interestingly, the new generation of Android Wear watches are starting to include it. I agree. Most merchants are hardly aware of Samsung Pay. It just works. That it just works probably hides some acceptance and use of mobile. On the other hand, while Samsung works on most POS devices, it is not on as many phones as Apple Pay. And even less support ‘magstripe emulation’. The problem for Samsung Pay is that premium S6 and S7 phones with the mag stripe transmitter only make up a small percentage of their phone sales, so perhaps that is why the article appears to concentrate on NFC solutions. Double in one year!? Where are all those critics that said mobile, and Apple Pay in particular, could not possibly succeed? BLE for payments is now emerging. Apple Pay that requires NFC can become passé. Tim Cook won’t dare cripple the iPhone to disallow BLE the way he has crippled NFC to disallow the iPhone to function with NFC tags.